Some photographs I took of the stained glass windows in Liverpool Anglican Cathedral, on a photography workshop yesterday: Angel of the North West; Crucifixion :: Resurrection; Nativity; Death has been swallowed up in victory. We are back home after a wonderful family holiday skiing with Jo’s parents in Ellmau, Austria. It was a series of firsts: Elijah’s first (and second) time on a plane; Elijah’s first time in Ellmau, and Susannah and Noah’s first time there in winter; Jo and my first ski trip in fourteen years (too long!). 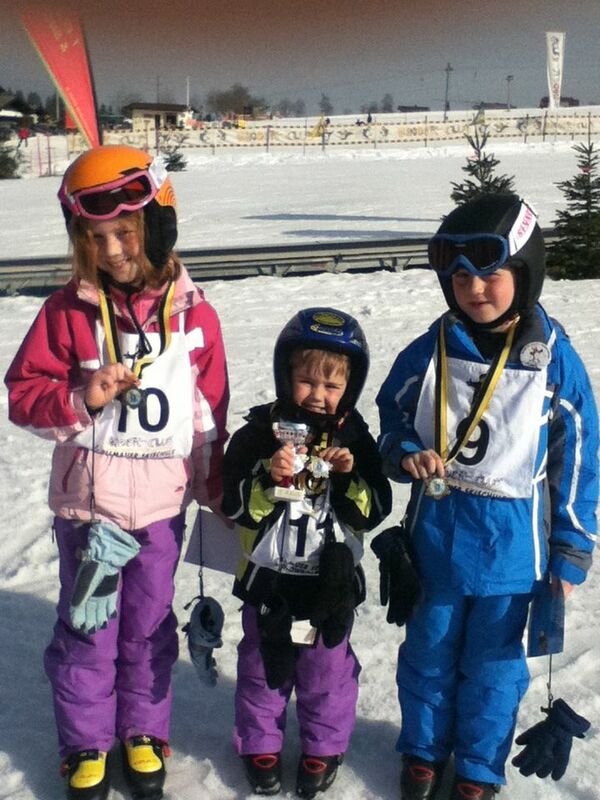 The kids loved ski school (on the whole). We ate and drank, and went to bed early, exhausted, and ached in the mornings and the late afternoons. On the last day of skiing, the kids all raced in a time-trial slalom, a field of around 23 beginner skiers, in which Elijah came second and was presented with a trophy on the podium (first trophy on the mantelpiece). The snow was poor – it hadn’t snowed for a couple of weeks, so we were dependent on snow machines, and off-piste the slopes were more green than white – and by the afternoon the pistes were a choppy sea of sugarbanks, but we still managed to get plenty of skiing in. And on the last afternoon, we all took the chairlift up higher and skied down behind Grandad, stopping halfway down at a mountain hut for gluhwein/hot chocolate. I am so proud of our kids – great followers. Mike Breen posts very helpfully on how immature apostles, prophets, evangelists, pastors and teachers impact others, here. Immaturity, of course, does not imply wilfully bad behaviour (though that happens), but describes the condition of not yet having been discipled to maturity: just as children are appropriately immature, it is a good starting point, though a bad place to remain, to not grow-beyond into maturity. You might be an apostle if your CV shows that you have a track-record of starting new careers and quickly dropping out and trying something else (though this may simply indicate an extreme lack of self-discipline); or if you have been successfully involved in developing several start-up or short-term projects, but these have either failed to translate into something long-term or you have struggled to remain effective when they have. You might be a prophet if you are confident, perhaps even at times over-confident, that you see how a structure (such as an organisation: your workplace, the government) or system (ethos to a workplace, way of doing things) needs to change – to be more just; or to be fit-for-purpose or ahead-of-the-game in a changing future – but you struggle to involve other people, who may be better equipped to communicate the need for or actually implement that change, because to do so would inevitably require and result in a compromise of your ideals. You might be an evangelist if you operate as a ‘salesperson’ (not necessarily in a formal sense) for a particular product, or in ‘public relations’ for a particular organisation. This may include yourself, your own ability – and where this is perceived to be aggressive, as it may often be, it may have resulted in unpopularity. You may be an evangelist if you struggle to accept that others do not share your passion, or respect their right to not do so. You might be a pastor if you regularly find yourself a trusted confidante, because you affirm people in their disputes – genuine or perceived – without asking them to see the other person’s perspective, or challenging their attitude or behaviour. You may well have a strong desire to avoid conflict at all costs. You might be a pastor if you need to be needed – which may be manifest in nurturing co-dependency. You might be a teacher if you have a love of learning – within your particular field, or any sphere – for the sake of acquiring knowledge, even the status of ‘expert,’ but lack confidence to – or even any interest in – passing learning on to others. that each type of person plays a different, and necessary, role – but that our different approaches can cause real tension, even conflict, and so we must learn how we differ and how to work together, including confessing our failures and forgiving one another. This is not a ‘church’ role, but a ‘life’ role – the way in which we are called to play our part in God’s mission to create environments for life to flourish, and preventing life from being overwhelmed by chaos...and at the same time, the way in which we can contribute to the chaos, if we misuse the grace we have been given. Therefore, it is important to me to find ways of helping people to discover how God has made them, and how to live according to that grace. One of the things I want you to see is that apostles, prophets, evangelists, pastors, and teachers function in different ways in the same workplace. To illustrate, consider five British chefs: Heston Blumenthal, Hugh Fearnley Whittingstall, Jamie Oliver, Nigel Slater, and Marco Pierre White. Heston Blumenthal is a pioneer: absolutely committed to the tradition and discipline of cooking, but always seeking to push the boundaries, to do what has not been done before; to pursue a faithful improvisation, exploring, experimenting, re-inventing, paring back, challenging received wisdom. In this way, the vocation of preparing food is renewed – called back to, and forward in, its purpose. Hugh Fearnley Whittingstall is a prophetic voice, in particular addressing the supermarket Empires and the ways in which they exert control over producer and customer alike, and (as a meat-lover, not a vegetarian) excessive cruelty in the production of meat. In this way, our attitudes as eaters, and the practices of the food industry, are challenged to reflect justice and the care of the earth. Jamie Oliver is an enthusiast and passionate communicator, who is on a mission to bring people the good news that healthy and tasty eating is not beyond our ability to prepare, in time or financial expense or effort; and to encourage us to pass on what we have learnt to be true, so as to change the culture in which we live. In this way, the ability to cook is extended to those who previously lacked the knowledge, or even the knowledge that it was possible; and good news is shared, and shared in the face of many bad news stories about the state of our food health. In many ways, Nigel Slater is the antithesis of Heston Blumenthal, believing that “Real food means big-flavoured, unpretentious cooking. Good ingredients made into something worth eating. Just nice, uncomplicated food.” For Slater, food is about emotional comfort, and physical delight. His concern is that, in the pursuit of the vocation, the human need at its heart is forgotten. In this way, chefs are reminded that they do not serve themselves, but others; and that where in focussing on the food the person is forgotten, the vocation has gone astray. Marco Pierre White was the youngest British chef to be awarded 3 Michelin stars. But White retired from cooking for customers, and has poured his energy into mentoring apprentices. Of course, the other chefs I have looked at in this post also train others, but in White’s case it is a primary focus, more than just an aspect of another pursuit. In this way, the next generation of chefs get their start. This is just one example, and – as any one example inevitably is – a limited example at that. The point is to illustrate how different people-gifts serve different roles; that we need all five roles at play; and that the coming-together of roles can create conflict (some combinations more than others) (or blind-spots - some combinations more than others). What has God given you grace and gifted you to be? Apostle, prophet, evangelist, pastor, or teacher? And how might you better work according to that grace? This morning we are giving thanks for answered prayer – and for all of you who prayed for Noah. Yesterday the doctor told us that the cut was too deep to glue, and that Noah would need stitches this morning. This morning, there was no need for stitches – or even glue. And there was confirmation that those who had made the decision yesterday were surprised by today’s news. God is good. My reflection is this: that to pray is to make a deliberate decision to locate ourselves within the kingdom of heaven. We may not get what we want, but in choosing to stand there, we receive what we need. Today has been very windy here. The wind caught an external door, and the door caught Noah’s head, and left him with a nasty gash. He has been to Alder Hey (Liverpool’s children’s hospital) and his head has been cleaned and well-bandaged. But he needs to go back to the Plastics Department at 7:30am GMT tomorrow [ignore the time-stamp on this post, which is set to Blogger’s default California time] to have his head stitched. He was quite frightened today, and the hospital staff have told us that they may need to put him under, as he might be too distressed by a local anaesthetic approach. If you are someone who prays, please would you pray for Noah (aged 8)? In particular, please pray that he would have the peace to cope and that it will not be necessary to use general anaesthetic tomorrow; and that the rest of our family would know peace too. Thank you. Jo and I belong to The Order of Mission, which is a dispersed Order within a wider ‘new monastic’ movement. [See ‘What is TOM?’ and ‘Who is TOM for?’ for more details.] In keeping with other Orders, members of TOM take certain vows. Vows give shape to a covenant relationship. For example, marriage vows – “...to have and to hold from this day forward; for better, for worse, for richer, for poorer, in sickness and in health, to love and to cherish, till death us do part...” – give shape to the relationship between husband and wife – and to the parent/child relationship, because covenant vows by definition extend to any present or future children of either party. We offer all that we are – the strengths and the weaknesses of that – and all our resources – potential (e.g. intellect) and actual (e.g. material belongings) – to face together the various challenges life will inevitably throw at us. Of course, how these vows are worked-out – how the shape they provide is filled-in – will vary from marriage to marriage, day-by-day, and after the event of taking them. Over the weekend, Jo and I helped lead a retreat for a group of people from across the north of England who are exploring whether joining TOM is the right thing for them. I had been asked to talk about the vows – a commitment “to devote myself to a life of simplicity, purity and accountability, within The Order of Mission...” – and shared how seeking to live out those vows gives shape to my belonging to other members of the Order, and to God’s particular covenant commitment to us. The vow to live a life of simplicity is a re-articulation of the traditional monastic vow to poverty. Choosing to renounce personal ownership was a prophetic action to a Church ensnared by material opulence; today, at least in the UK, the Church is ensnared by a poverty spirit – by the perception of lack, and the inability to receive and enjoy God’s generous provision, and to be generous givers in turn. ‘Simplicity’ enjoys God’s gifts, and holds them lightly. But ‘poverty’ was always an outward sign of something else: of giving up ownership of self, and choosing to live as God’s possession. For me, committing to a life of simplicity is about recognising that I am God’s, of giving myself to his disposal, of seeking to discover and – forsaking all other distraction – to prioritise that particular call for which God has chosen me. For what God brings to a covenant relationship shaped by simplicity is a particular purpose he has chosen me for [see here for more]. And within the Order we commit to one another to this life: to follow the One who calls us. The vow to live a life of purity is a re-articulation of the traditional monastic vow to chastity. Again, abstinence was intended as an outward sign of something else (abstinence as an end in itself is hatred of self, not love of an Other): of being set aside for God’s purposes. In the Bible, purity overwhelmingly relates to items in the tabernacle made from or covered in pure gold. The tabernacle was the tent in which God lived among his people, having rescued them from slavery in Egypt. The purpose of the items within the tabernacle was to facilitate God’s living in the midst of his people. Later, in the courts of David and Solomon, purity came to be applied to the human heart: the wisdom sayings collated by Solomon’s court include a specific connection made between pure gold and pure hearts: “The crucible for silver and the furnace for gold, but the Lord tests the heart” (Proverbs 17:3). Gold is subjected to great heat; impurities rise to the surface, and are skimmed off. And to the early church, James writes, “Consider it pure joy, my brothers and sisters, whenever you face trials of many kinds, because you know that the testing of your faith produces perseverance. Let perseverance finish its work so that you may be mature and complete, not lacking anything.” (James 1:2-4). [See here for more.] As I seek to live a life devoted to purity – to being set apart for God’s purpose of living with us – I discover just how seriously God takes my devotion: again and again, he allows me to be tested by trials in order that any impurities in me – any area of my life which is not set apart for God, which resists that decision – rise to the surface. And that scum – literally – is unattractive, which is why I value the Order, that there are people who are committed to me and to my purification. The vow to live a life of accountability is a re-articulation of the traditional monastic vow to obedience, to the senior member of the Order in any given monastic house. ‘Accountability’ takes into account our dispersed nature – both in geographical location and within a diverse range of workplaces. But ‘obedience’ was an outward sign of commitment to God’s call, the outworking in(to) the world of the vow to poverty and the vow to chastity. The vow of obedience recognises God as Father. While we hold on to that, the re-articulation of ‘accountability’ is Christ-centric, recognising what Jesus brings to a covenant relationship shaped by accountability: “I no longer call you servants, because servants do not know their master’s business. Instead I have called you friends, for everything that I learned from my Father I have made known to you.” (John 15:15). Jesus has chosen to make himself accountable in his relationships – to share life, and within that to share everything he has learned from the Father. Within the Order, we seek to live in that way, as friends. In every way, there is nothing about TOM that should be any different from the life of a disciple of Jesus. And yet the reality is that these things are easily lost. I would not choose to walk this path alone. Nor is TOM the only way to pursue such a life: but it is the company among which Jo and I have been called to journey.